When it comes to media, the day is always fluid as news flows quickly. 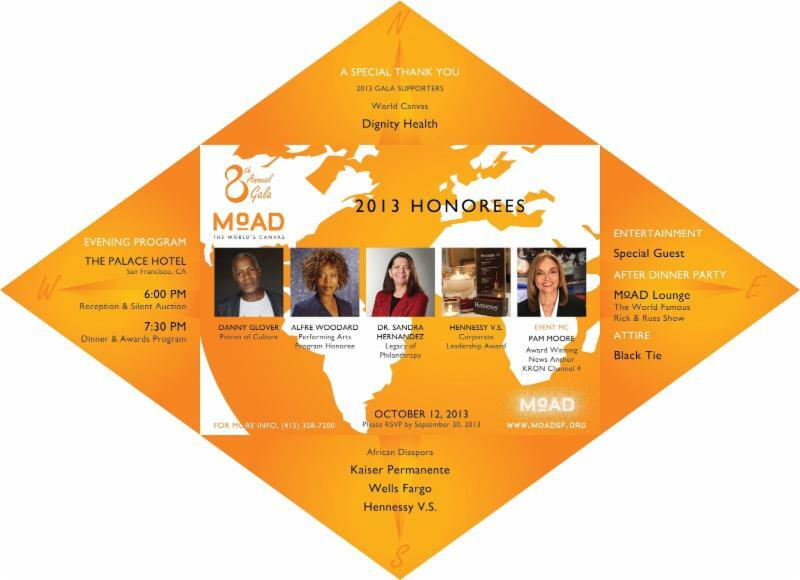 A fellow media entrepreneur and San Francisco NAACP Communications Committee member called me a few hours before the Museum of the African Diaspora (MoAD) gala at the Sheraton Palace Hotel. I had covered the event last year and thought it was one of San Francisco’s top classy funding soirees. I agreed to cover the event. I told my cameraman to pack up and I went over near the Sheraton Palace’s Maxfield Pied Piper Bar and Grill, where that famous $7 million painting of “The Pied Piper of Hamelin” by Maxfield Parrish hangs. Upon my return, my cameraman is still set up and shooting interviews. When I asked what was going on, he responded, “I talked to the lady and she said it was all right.” So I stepped outside to the lobby once again. It was my goal to utilize the occasion to shoot a public service announcement (psa) with Danny Glover and Barbara Rodgers, who were both in attendance, for an upcoming San Francisco NAACP gala, on Nov. 9. It would have been great to capitalize on the moment and get them together asking people to attend the NAACP gala. My company had shot a commercial with former San Francisco Mayor Willie Brown previously. Former San Francisco Mayor Willie Brown invites viewers to the NAACP gala on Nov. 9. Shooting the on-the-spot psa could help boost ticket sales and sponsorship for another very worth event. As I stood in the lobby, the cameraman brought the equipment out of the event reception area and we started doing some interviews. Then Michael approached me again and said you can only shoot inside although I saw some others were shooting outside. I told my cameraman to get an interview with actress Alfre Woodard and let’s go. As I wait for his return, several media colleagues and friends came and greeted me. Both Carla Thomas from the Post News Group and “PR and Events Queen” Carla Thomas, who works a great deal in L.A. (I am not sure if they met each other), Belva Davis, Mr. and Mrs. Maxwell Gillette, Dr. and Mrs. Toye Moses, Petra Brady, Fred Jordan and Renee Dunn Martin took photos with me in between interviews, along with many other guests. Here’s some of the story. My coverage of the MoAD gala was interrupted because of my previous coverage of protests against Wells Fargo. Then he said, “It’s because of what you did in the Bay View.” “Me in the Bay View?” I asked in wonderment. “Yes, in the bank!” At that point I looked over my shoulder and I saw the Wells Fargo security staffer who I recognized from covering a demonstration at Wells Fargo CEO John Stumpf’s home, a $5 million condominium in Pacific Heights. He was security detail for several demonstrations protesting Wells Fargo’s unjust foreclosures. Those demonstrations also included protesting at the Wells Fargo Branch where Brenda Wright’s office is located. Wright is on the board of directors of MoAD. Wells Fargo had recently been removed from the board of the San Francisco Employee Retirement System (SFERS) as a result of protests by ACCE (Association of Californians for Community Empowerment). The advocates for a humanitarian solution to foreclosures felt it was unfair to have Wells Fargo on the SFER’S board making decisions about the millions of dollars from the work of City workers on one hand and yet putting many of its elderly members out on the street through foreclosure on the other hand. Once I realized this was retaliation for my advocacy work, I asked for the security guard’s supervisor, and he told me he was the supervisor on duty and he was going to call the police. So I went to the front desk and talked with the manager and another security guard, getting their names as witnesses to what was going on. As I left the front desk, I was greeted by more people I know. One was Barbara Rodgers, a fellow journalist. For over 20 years I have known her and her former husband Jim Dennis, an accomplished and well-known photographer. I was in the middle of asking Barbara to do a quick psa for the SF NAACP gala when a staff member of Cathy Adams rudely interrupted, “You can’t do that!” It should be noted Cathy Adams is a friend and business associate of Wells Fargo executive Brenda Wright. From the misinformation out of Fox News to the manipulation of media by companies owned by media mogul Rupert Murdock to local news being ignored by network affiliates because the lines between news editorial and sales have been blurred, our democracy is in great peril. We have a shortage of independent media. Without it, the masses are easily misled and are lulled to sleep. The actions by those at the MoAD gala protecting the perceived interests of Wells Fargo and its executives impacted my ability to work as a journalist. Morally and legally it was wrong. The bottom line is, because you work for a multi-billion company, you should not buy or control the media. “Free press” is essential to a free democracy. Thanx for this sharing Nice article.